After a 21-year odyssey, D.C. United finally broke ground on its new home Monday afternoon. WASHINGTON — Wielding an actual machete triumphantly above his head, D.C. United Managing General Partner Jason Levien looked like something of a 21st century pirate celebrating his latest and biggest conquest. 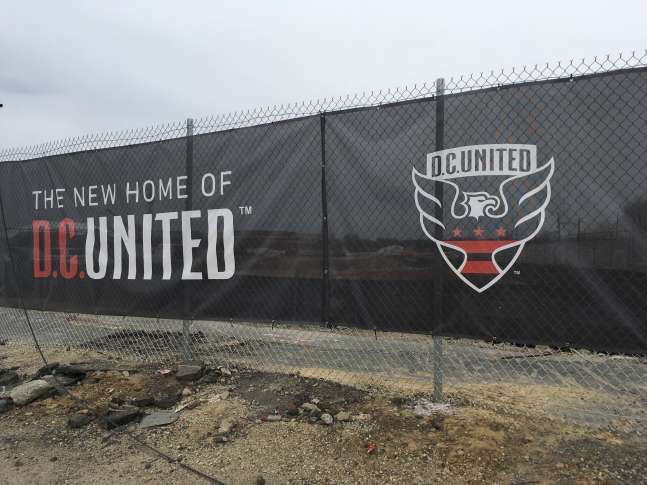 After 21 years and five ownership groups, D.C. United finally broke ground on its new, permanent home in the District Monday as shovels hit the dirt on the future site of Audi Field in Buzzard Point. The blade itself was a gift from supporters, given to Levien at his first game. He used it as a symbol, a metaphor of the red tape others tried and failed to clear to get to this day, with pomp and circumstance that shone brightly through the overcast February afternoon. It was the kind of day that reminded anyone watching just how long and weird and winding the path to that pile of dirt has been, replete with personal tales of fandom, MetroStars references, and more than a half dozen speakers from the team, city, league and naming rights sponsor Audi. The odd byproduct of a stadium saga that takes 21 years to see to fruition is the legitimate claims to fandom that develop in the intervening generation. They were visible everywhere Monday: Ben Olson, a fresh-faced player back in the late 90s, leading the charge as head coach; Ian Harkes, son of United legend John Harkes, in attendance before his first MLS season. While the Southwest Waterfront and Buzzard Point area feels a world away from RFK and the banks of the Anacostia, United’s new home will actually remain within Ward 6, close enough to Nationals Park to read the red lettering above the ballpark’s South Capitol Street entrance. That means the Black and Red will remain not just within D.C. — something that once looked unlikely — but also within Councilmember Charles Allen’s territory. Perhaps it was fitting that he had the most biting reference to the team’s stadium search saga. “I’ll say, Loudoun County United just doesn’t have the same ring, does it?” Allen said to open his remarks. Groundbreakings are never short on goodwill, and Monday’s was no exception. There were only passing references made about the very tight timeline upon which the team has put itself, as it plans a June 2018 opening, less than 15 months away. That’s an even tighter time frame than the one the Nationals needed to complete the Ballpark of the Palm Beaches, their new Spring Training home that opens Tuesday, but with multiple areas still under construction. That, despite expanded construction crews working 20-hour days since September, the timeline is sending the project a reported 10 percent over budget. Audi Field will be roughly three times that size, comparable in size, scope and design to Avaya Stadium in San Jose. Everyone in D.C. is hoping to avoid the same issues that Avaya faced, though, twice seeing its opening pushed back, taking nearly two-and-a-half years from groundbreaking to opening day. Riding the energy of the day, Levien refused to talk about any potential backup options. If there was any question as to who the face of the franchise is entering this new era in its history, starting goalie and Annandale native Bill Hamid erased it by following Olsen to the microphone. The last of a 45-minute procession of speakers, Hamid spoke of his own personal past, growing up watching games at RFK. To that end, Levien hopes to retain the atmosphere that has made RFK such a rowdy environment and tough place to play. It’s always a concern with a new arena, especially when going from such a tailgate-driven atmosphere that exists at RFK to one that will look and operate a bit differently in Buzzard Point. First, of course, there will be the final planned season at RFK, which begins Saturday against Sporting KC. The team returns its core along with a few exiting additions as it looks to build on consecutive playoff appearances and get back to the MLS Cup for the first time since 2004. But Monday was all about the future. There was plenty of talk of economic development; of the way the neighborhood will be revitalized; of the new jobs, 51 percent of which are guaranteed to District residents. And it was brought home best, perhaps, by MLS Commissioner Don Garber, who related the story of the first time he’d ever been in a team locker room, back at RFK at United’s beginning. The 16th stadium opens this weekend in Orlando, and Audi Field will make 17 next year. MLS has expanded to 22 teams, with more markets emerging each season. Finally, one of its founding members will have a permanent place in the District. “After 21 years, this franchise is finally going to have its own home, its own stadium, its own cathedral for soccer,” said Levien.